Vigilante groups had the task that in case of danger every adult man would take a weapon and defend his city. In addition, police tasks were partly taken over by vigilante groups when regional peasant uprisings threatened. The pole arms of a vigilante were mostly simple construct but effective and could be used in many ways. Their spears could keep the enemy at a distance and could also be used against horses. 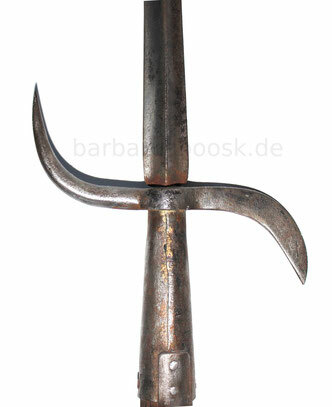 Their barbed hooks were used to pull enemy soldiers out of the line; most of the time by hitting in the neck. The protruding blade, on the other hand, should fend off the enemy's sword strikes or parry enemy pole arms and push them away. This pole arm with original wooden shaft measures about 2 meters in length and dates from the 18th century. The spear has a massive midrib and measures about 43 cm.